I can’t believe that my clothing line has finally launched!!! Head over to rachelparcell.com to shop the spring collection! 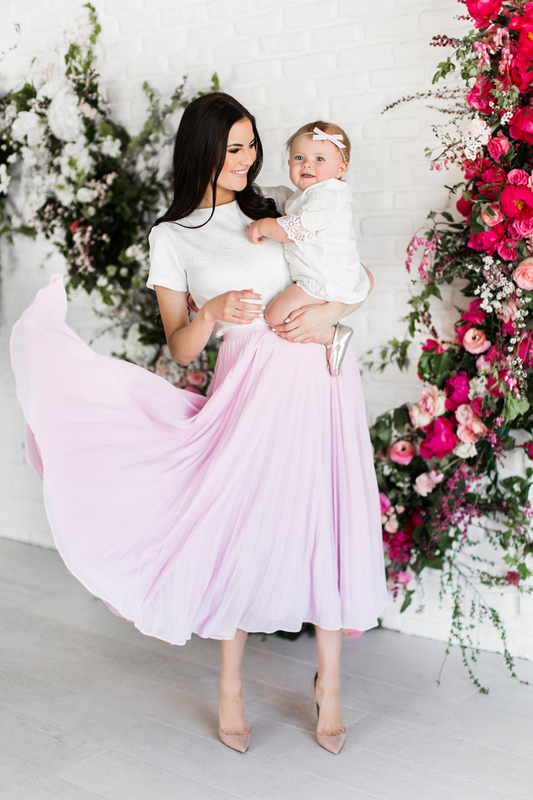 Also if you’re a mama of little girls and want your babes to coordinate with your Rachel Parcell pieces, I’ve designed a mini collection of baby and children’s bows for Free Babe’s Handmade. You can view that collection here! Thank you SO much for all your support over the last week leading up to the launch. Love you all!! Rach!!! Huge Congratulations for your amazing collection!!! I want them all!! That dress with flowers…OMG! Thanks Daniela!! I just clicked over to your blog – it’s really cute. Good job! wow congratulations! the collection is amazing, so you! Love the fresh and light colors and the cute long pleated skirt is my favorite! I love how effortlessly feminine your line is! It’s gorgeous! Oh my!! You did an incredible job on this collection! Congratulations!!! Thank you Natali!!! You are so nice. I’m glad you like it!!! Beautiful pieces, I want them all! Congratulations! Congratulations Rachel! You have done an amazing job- I love every single piece of the collection, and it’s so very you! You should be proud of yourself, what an amazing achievement. Thanks Madeleine!! We will see, it’s super exciting and scary all at the same time haha. Thanks for your love and support!! And yes I hope to have international shipping soon too!! Congratulations on your collection! It’s gorgeous! The skirts are perfection- feminine and beautiful! I cannot wait to twirl in my pleated midi skirt! This looks amazing! I love it! You have such great fashion sense and your line will do great! I am so excited for you! AMAZING! All of the pieces in your clothing line are gorgeous!!! Congrats on the collection! It is gorgeous! I love the pleated skirt! Thanks Rach :) I love it too!! Congratulations!! 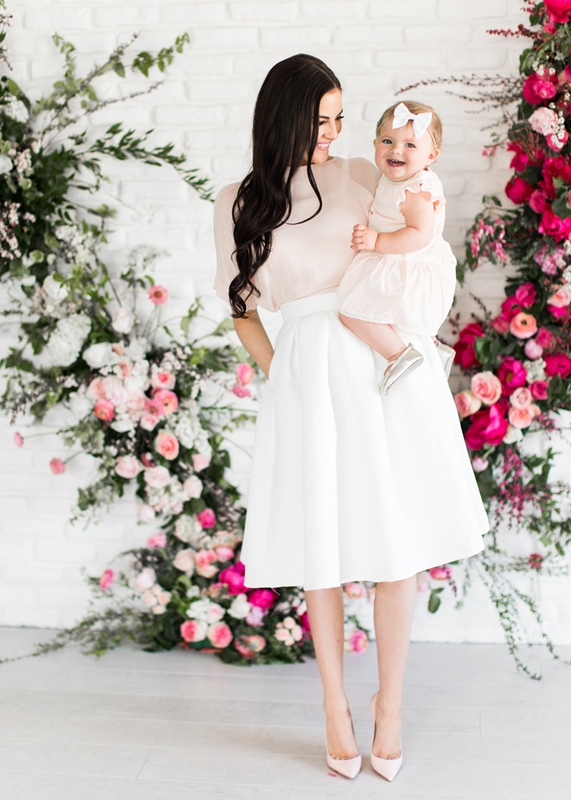 Everything is beautiful but I think the Peony Pink Lace Pencil Skirt is my favorite! Good choice ;) That’s definitely up on the list of my favorites as well! Thanks for following along! What an amazing collection Rachel! Each piece is simply timeless!! Thank you!! I’m excited to shop the collection! Oh my gosh, I need everything. Too bad my next trip to the States is only in December but I’ll definitely be ordering then. Your designs are incredible Rach!!! I couldn’t be more excited for you! Wow, your collection is so timeless and feminine! Can’t wait to someday have one of your pieces in my wardrobe! ? beautiful collection, congrats! love the midi skirts! 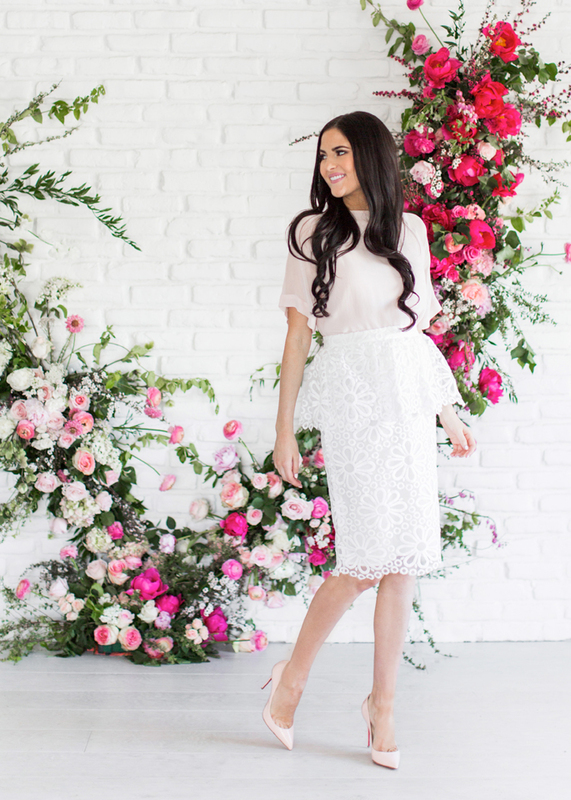 I am so obsessed with the pink lace pencil skirt and the classic full skirt! So cute! Thanks Destinee :) Glad you like it!! gorgeous collection! so happy for you – congratulations! Wow!! I love all the pieces you have created! So beautiful! Congratulations! And congrats on your second child! The pics you used to announce your pregnancy were stunning and a beautiful testament to life! God bless! Absolutely beautiful!! I love each piece! Congratulations!!! Congratulations on the launch of your line! Love all the pieces – they are so feminine and gorgeous! Thank you Sharan :) I’m happy we’ve finally launched and I can finally share my designs! I want all of these pieces! They are so classy and chic. Congrats on the launch, Rach! Those pink midi skirt are super cute! Beautiful collection and so you! I cannot WAIT to head over and check out your new site!! Such pretty pieces … and totally your style. I love it! Best of luck to you Rach! I just order the floral print dress. I’m so excited for it to come! Congratulations! Oh my gosh you will LOVE it!!! 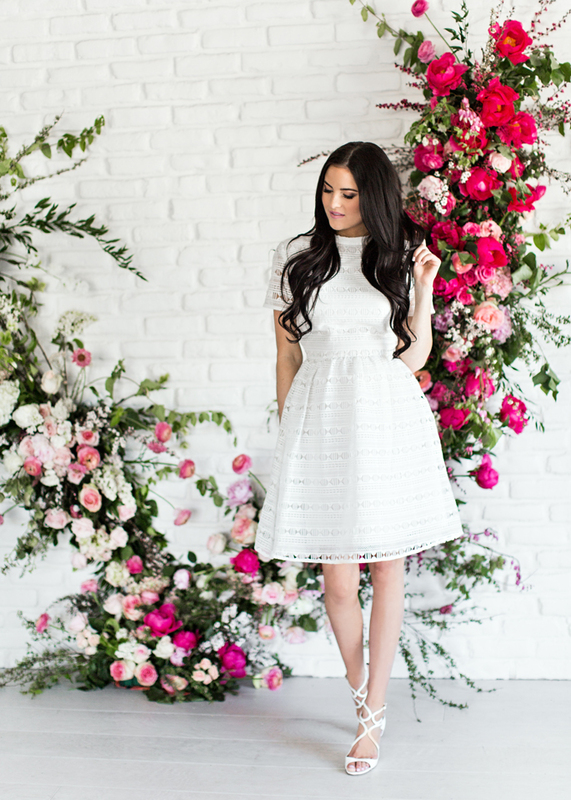 And you will look amazing in it :) Be sure to share how you style it by tagging @rachelparcell in your instagram pic. Can’t wait to see what you think! Everything is gorgeous and so classic. Amazing job Rachel! How exciting!!! Everything looks so beautiful – the pictures, the pieces, you! Definitely will be shopping. These dresses and skirts are gorgeous. Can’t wait to see more! How girls are the best!!! You will love being a mom :) Congrats on your pregnancy! Congratulations! ! I love every single piece! My fav is the blush lace dress ??. Quick question, in your opinion do they fit on the smaller end or do they run big? Just a lovely lovely collection ! Thanks so much Jill!!! I think the collection really reflects me and my style :) Glad you like it! Beautiful clothing line. I am in love with the RP classic dress in floral room. Wish I could afford it on a college girl budget. The Pleated Midi Skirt is adorable!! Congratulations, this is so exciting! Thanks Jen :) You are so sweet! I LOVE your new collection. Everything is sooo pretty!! Such a beautiful collection Rachel! I love the pink skirt. Excited to see what is next! Congrats on this stunning collection! Congrats Rachel! The entire collection looks absolutely stunning. I am so excited for you as you enter into this new chapter. Thank you for inspiring me Rachel. Good luck to you as you experience this new adventure. Thank you so much Anna-Maria! Seriously such a sweet comment to read. I love the everyday dress! But I would love to see it in other colors! I want everything! ? It’s so beautiful! Everything is perfect! Congratulations!! Can I say Isla is actually getting too much attention??? My eyeballs are drawn to her in every pictures. She’s the cutest baby ever!!!! This collection is seriously dreamy! I love the universally flattering cuts, perfect pinks, and feminine feel! Truly, everything from the product to the website is styled and designed so well and cohesively! I only hope that in time you will launch even more extended sizing, so that a girl like me (a size 16) can get in on the action. Congrats on this huge step, you should be immensely proud! Wow! You collection is beyond stunning! So feminine and sweet. Perfect for spring. Congratulations! I’m so excited for you Rach!!!! Your line expresses your personal style so perfectly! I’m in love with it all! The white dress is so stunning! The detail and fit is incredible! The Everyday black dress is perfection. I love your take on the LBD for spring/summer. The length makes it so effortless and perfect for so many events. I’m dying over your skirts- the different silouettes and fabric! Your line is definitely embodies femininity, class, and modern elegance! Congratulations! congratulations on launching your Spring collection. And, u didn’t disappoint with the beautiful collection. Love the bright pink skirt and white dress. Wishing all the best! Congrats on the launch! It’s an amazing collection and the price points are great! I forgot to ask, is there a way to post measurements? I’m petite, 5’3 and not sure if, for example, the pencil skirt will be too long for me. Thanks! This whole collection is beautiful – congrats!! Congrats on a beautiful collection! I love all of the pink and lace! THIS IS ABSOLUTELY BEAUTIFUL!!!! Can’t wait to start collecting Rachel Parcell pieces!!! Congratulations!! Congrats! The pieces are beautiful…Loving that everyday dress!! OH MY GOSH RACHEL YOU ARE MY FAVORITE!!!! I love these classic modest pieces, you are amazing and I am so proud of you! You did amazing work! lots and lots of love!!! I am LOVING all of these looks…you must have been super busy working woman! and a new baby on the way,a s well. Congrats on the new clothing line – I love everything! Beautiful! Way to go girl!! I love your collection!! Everything is so pretty and I can’t wait to get my peony pink lace skirt! It will be the perfect thing to wear after I give birth in a few days!! I also love the white lace dress and I was wondering if you will be restocking it since it’s sold out? I can’t wait to see what you come up with next! We will hopefully be restocking it soon!! Keep checking back :) And best of luck to you and your new babe!!! Hi Rach! I love your collection…so classy and feminine. Will you be offering petite and XXS sizing in the near future? Thank you Linda!! As we grow we hope to be able to offer more sizes – thank you so much for the suggestion! Oh my goodness, it is just lovely. Exactly what I’d expect! I can’t even imagine how exciting it is to have your own line, so cheers to you for making this happen and putting so much attention to all the details. Well done, mama! Everything is amazing! I am so excited for you. XO. Congratulations on your collection. I love them all! Thanks Christianne!!! Glad you love them! I love the collection. It is so beautiful! Omg I LOVE your collection! Your pictures are stunning! My fave is the “Everyday Dress” <3 Congrats on your launch! Love the collection! One of the dresses I wanted was sold out. Looking forward to your next collection. Congratulations!!! 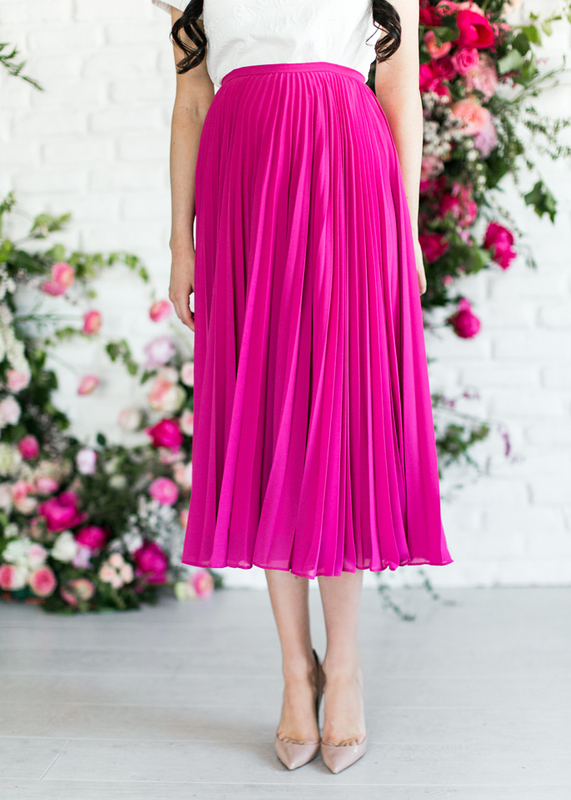 I already ordered a dress this morning but I think I’m going to make a second purchase for the blush pleated skirt! Is there a zipper on the back? Congratulations on this gorgeous collection! Oh which dress did you order this morning?! Ya the blushing pleated midi skirt has a zipper in the back. Congrats on the line! The pieces are totally gorgeous!!! Every outfit is awesome!!! I love the looks! My favorite are the hot pink skirts!!! Than you so much Tara!!! This entire collection is absolutely stunning, I literally want every single piece! Huge congratulations on your AMAZING collection, the clothes are fabulous for any feminine, classic woman during spring. When I’m older, one of my goals is to launch a clothing line like you have, and yours is above and beyond! I have to know, which piece is your favorite, or the one you would most likely recommend? I’m eyeing the “RP Classic Dress in Floral Bloom”, the “Embroidery Anglaise Dress”, and one of the pleated skirts (but I can’t decide which color!) Thanks for being the perfect role model! I am VERY impressed with your new collection! I remember meeting you at J Crew a few years ago- you have come so far so fast! I love how classy each piece is, you have a real talent. Congratulations! Thanks Erin!! I remember meeting you :) Thanks for supporting me over the years and following along! So exciting!! Everything looks just like you!! Pink, classy, perfect, girly!! I love it!! congratulations! the collection is SO YOU and beautiful! They are all beautiful, but the first one is my fav! Congrats on the collection. Congrats, love all your pieces but the lace skirt has to be my favorite!! Congratulations Rachel! Amazing collection! The peony pink is to die for! May I ask if you ship international? I live in Greece. Beautiful collection! Love every piece! I’m obsessed with that pink skirt! Congratulations and good luck Rach! Gorgeous! Love how feminine all these pieces are. Do you mind sharing where the tops in this post are from? They pair so beautifully with your skirts! I love the whole collection!!!! Just curious is the black everyday dress going to be restocked in the x small??? All the pieces are absolutely beautiful!